Being in this project in Singapore for three weeks now, I’ve had a lot of flashbacks from my previous lives before this residency. It feels interesting to be in a lab and be officially an artist and not a scientist, to be around academics and understand their academia-speak as though it were a second language I’m hearing again, and to be designing workshops instead of looking for art materials in this initial phase. 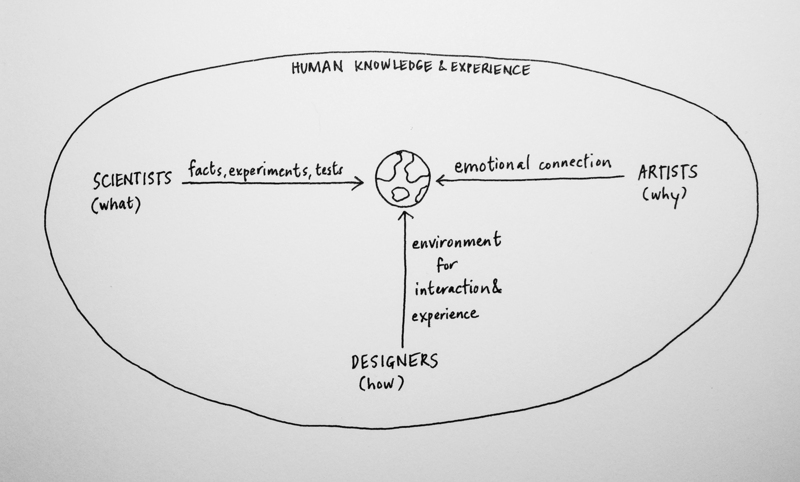 Having had different roles and modes of training and experiences, I think I’m coming into my own model of what my three primary fields (art, science, and design) are about, which isn’t to say that these do not intersect in an individual’s practice. I’m doodling this as a note to myself, and wondering if I’ll be thinking the same in four months’ time. Hmm.